9 posts categorized "BAKED Sunday Mornings"
I baked my share of olive oil cake so BAKED Explorations’ recipe for Mom’s Olive Oil Orange Bundt did not initially excite. The recipe may even seem a bit fussy with the extra leavening step of folding whipped egg whites into the batter. I decided early on to play around with this recipe to add a few of my own personal touches. Instead of orange, my choice of citrus is lemon for this cake. This started as a simple matter of saving an extra trip to the grocery store. However, once I decided on lemon, pairing it with thyme made a lot of sense. I always love the herbal pairing of lemon and thyme especially in shortbread cookies. So why not a bundt cake too? Although the recipe said this cake is delicious with a simple dusting of confectioner’s sugar, I could not resist the allure of a puckery lemony glaze. I once made David Lebovitz’s Zucchini Cake with Crunchy Lemon Glaze. I do not remember much about the cake but the unexpectedly crunchy glaze left me wanting more. Rather than only using confectioner’s sugar, granulated sugar is added to the mix. Before the granulated sugar has a chance to melt, the glaze is applied to the cake and thus creating a nice crunchy texture. Just a small change in ingredient and the result is completely different. 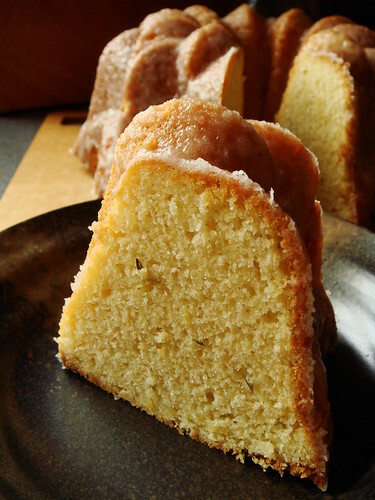 After all my little tweaks, my cake is more appropriately named Olive Oil Lemon Thyme Bundt with Crunchy Lemon Glaze. Cowboy Cookie is such an evocative name. 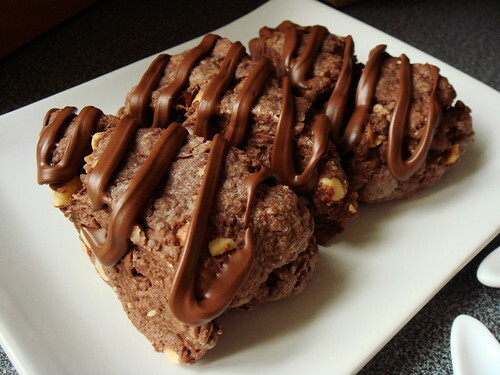 It makes me think of munching on these oatmeal cookies packed with chocolate and pretzel pieces in rugged terrain, possibly while traveling on horseback. Not that I know how to ride a horse. 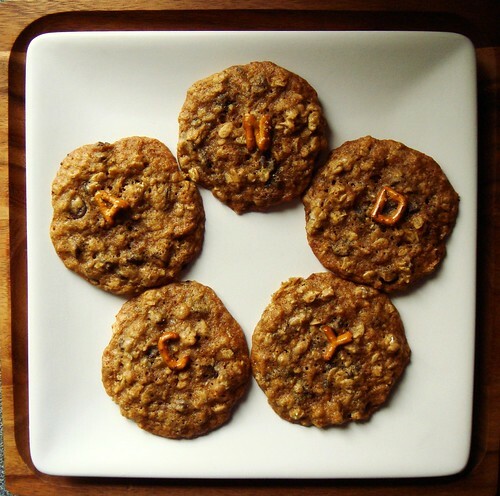 On the complete opposite side of the stereotype spectrum, my batch of Cowboy Cookies makes me think of cheerleaders because each cookie is topped with an impossibly cute pretzel alphabet. I can literally spell my own name in cookies. Give me a C-A-N-D-Y gooooooo CANDY! To be honest, I have never heard of cowboy cookies until very recently. The traditional combination of mixing oats, chocolate chips, and nuts into a sturdy cookie is not exactly groundbreaking and certainly does not inspire me to turn on the oven on a hot day. BAKED’s version cleverly replaced the nuts with salty crunchy pretzel pieces to achieve an addictive sweet and salty taste which is right up my alley. Choosing a good pretzel is key. In my quest for cute, I went for a bag of multigrain pretzel alphabets. They are my everyday pretzels because I love their diminutive size and low sodium content. Oops, low sodium is exactly what you don’t want for this recipe! My cookies turned out plenty sweet but not salty enough for my taste. I am impressed by the variety of food dubbed “New York-style” and how much people all over the world clamour to try the real thing. New York-style cheese cake, New York-style pizza, New York-style bagel, just to name a few. Of course there is also whole myriad of food not explicitly named New York-style yet uniquely delicious in the New York kind of way. Black and white cookies, pastrami sandwiches, bialys…this list of food lover’s “New York must eats” just keeps growing. Thanks to BAKED Explorations, I learned of yet another New York-style food not to be messed with: the New York-style Crumb Cake. How did the city manage to claim the humble coffee cake as its own? 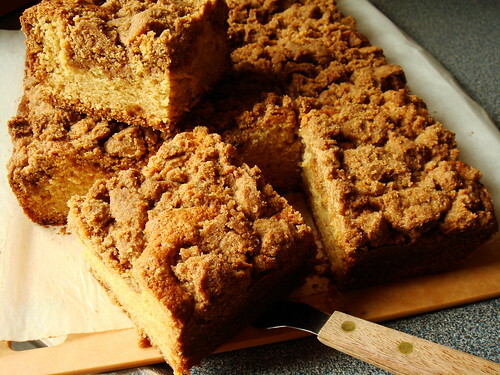 As Matt Lewis helpfully explained in the cookbook, there are a few things that makes a crumb cake New York-style. The huge boulders of crumbs, the large ratio of crumb topping to cake, no swirls, and the lack of nuts set this style apart from crumb cakes all over. Although my favourite crumb cake involves sweet tender pieces of apples baked inside the cake, I have an open mind when it comes to cakes. I almost made this cake exactly as written. Yes, almost. 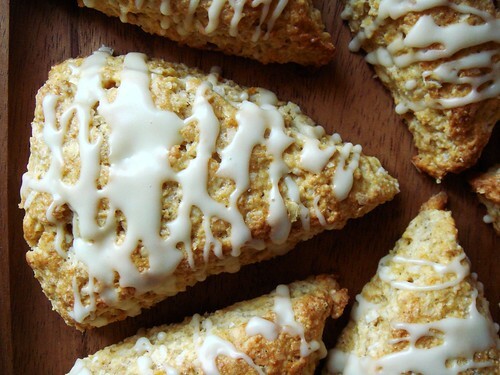 Carrot Coconut Scone with Citrus Glaze from BAKED Explorations promises a rich breakfast treat more in common with cookies than with the classic scone. This scone achieved tender flakiness from buttermilk and loads of butter cut into the flour. That’s where the similarities end. With the use of rolled oats, a touch of whole wheat flour (about 20%), and orange carrot puree, I can perhaps make a case of this scone being somewhat wholesome. But who am I fooling? Those sweetened coconut flakes, orange zest, and drizzles of orange glaze far outweighs any healthful claim. It matters not because the delicious taste is what leaves me wanting more. I made plenty of scones before (here, here, here) and have very specific ideas of what I like. My preference for super flakey tender crumb and nice sharp edges usually steer me away from more rustic recipes. Oddly enough, I am quite happy with how these carrot coconut scone turns out. The scones maintained good height after baking and the edges didn’t slope too much. Very even rise given that I barely pat the dough together into a disk before cutting into wedges. I did not add much flour while working the dough. It was a little wet as predicted in the recipe. In hindsight, probably a good thing because it discouraged me from working the dough too much! I’m not one who likes sticky dough all over my hands. How much do I like making multi component dessert? That depends on the reward. Is this something I do on a regular basis? No but that’s why some dessert are more special than others. How special is BAKED’s Malted Crisp Tart? Very very very special! Malted milk powder is used everywhere in this decadent tart from crust to filling to topping. A cookie tart crust is filled with malted milk chocolate ganache, crushed malted milk balls, shards of caramelized crisped rice cereal, and topped with a malted milk pastry cream lightened with whipped cream. Each bite of this tart is an explosion of various taste and texture. I cannot decide which I like best: the tender buttery shortbread cookie crust, the smooth and milky chocolate, the addictively crunchy caramelized crisped rice, or the billowy custard cream topping with a hint of malted milk. 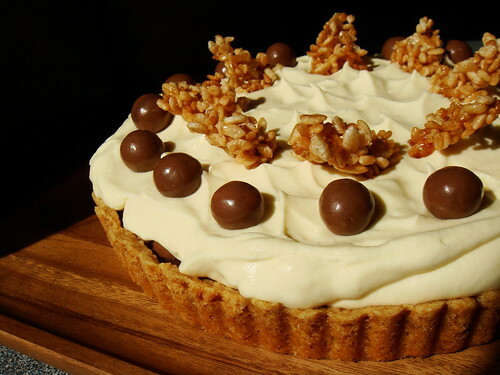 This tart embodies everything I like about Malteser and Horlicks, both childhood favourites. Yet it is re-imagined in a grown up format that I would be proud to serve at the fanciest dinner party. It’s no wonder both BAKED cookbooks make regular appearances in my kitchen. It's good to return to BAKED Sunday Mornings! This week we're making Farm Stand Buttermilk Doughnut, a classic cake doughnut leavened with baking powder, baking soda, and buttermilk. 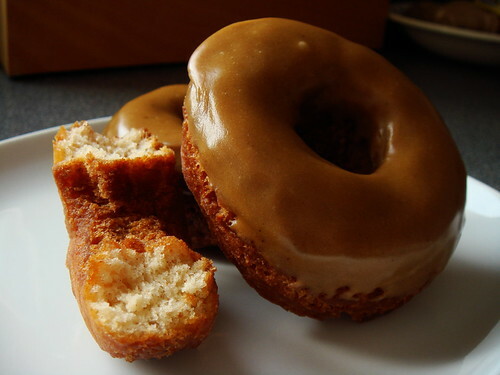 Or in my case, round 2 of Battle Of The Doughnut (check out round 1's double ginger yeast doughnuts)! I know there are plenty of fans out there for yeast doughnuts but I must admit that I much prefer cake doughnuts. The texture of deep fried cake is really appealing to me. As a novice to deep frying, I approached this recipe with trepidation. I had visions of splattering hot oil and lingering smell of burnt grease. To much of my surprise, deep frying was easy. As long as the oil remained at the specified temperature range, there was no smoke nor splatter. Why did I wait so long before attempting to deep fry? Just think of all those years of missed calories! Since I made both yeast and cake doughnuts at the same time, it was rather interesting to observe how different they behaved. For the yeast doughnuts, all the leavening happened before the dough hit the hot oil. The fermented and shaped dough were light and delicate. 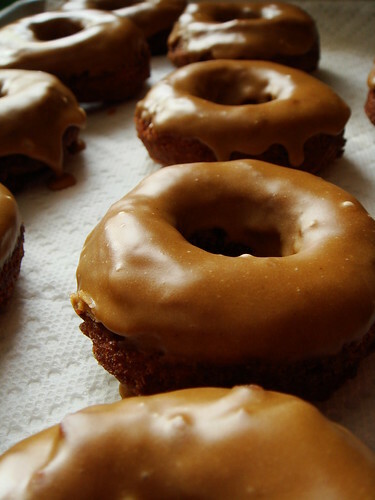 As for the buttermilk doughnuts, as soon as it dipped into the oil, the transformation was dramatic. The dough sunk briefly to the bottom of the pot before rising lazily to the top all puffed up. It turned from 2D to 3D! I went to the Baked Explorations book signing a month ago and thoroughly enjoyed Matt and Renato's demo of their signature Sweet & Salty Brownie. Any recipe that could be whipped up while chatting candidly with the audience with anecdotes of their baking experience cannot be that hard. Mixing sweet and salty in dessert is very fashionable in the last few years and I certainly count myself a fan (hello chocolate-dipped pretzels and chocolate-dipped potato chips!). 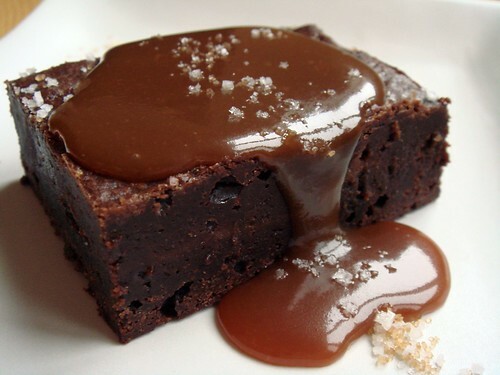 This Sweet & Salty Brownie is based on Baked's Original Deep Dark Brownie (recipe published in their first book or check out David Lebovitz's version with Altoids) with a layer of salted caramel sandwiched in the middle and flurries of fleur de sel on top. Cooking the salted caramel was a breeze, just remember to warm the cream before adding it to the pot of boiling caramel. The addition of sour cream was quite interesting. It adds a bit of unexpected tanginess to the salted caramel sauce. 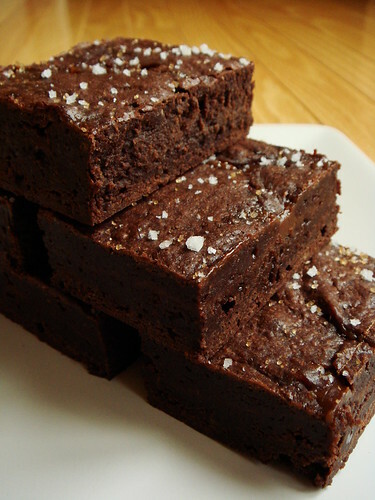 The brownie batter was typical of most fudgy brownies with zero leavening agents. I took care to beat in as little air as possible so the brownies would not turn cakey as the recipe advised. The most difficult part of the recipe was to refrain myself from pouring too much caramel between the two layers. It was such a delicious addition that it was hard to practice less-is-more. As is my habit, I chilled the brownies overnight in the fridge so it would be easier to cut. When it was finally ready, I was pleased to sink my knife into a pan of moist fudgy brownies. None of the caramel spilled out to the side of the pans so no chewy bits here! Later that day, I served myself a piece with some warm salted caramel sauce and extra pinches of fleur de sel and raw sugar crystals. Each bite melted in my mouth and I particularly enjoyed the extra hits of saltiness from the salt cyrstals. I shared the brownies with coworkers and was a little disappointed that not everyone appreciate the mix of sweet and salty. "The salt was weird" was among the feedback, sigh. My response was "Just brush the salt off the top". On the plus side, another coworker told me him, his wife, and even his toddler daughter all love it. 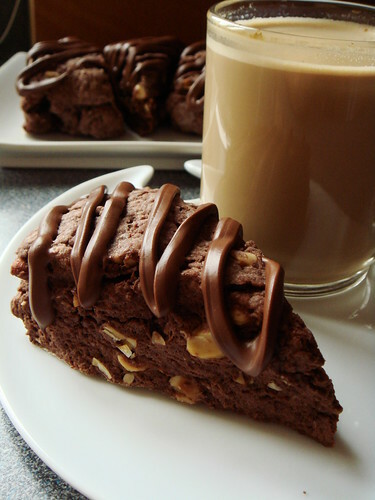 I will probably make this brownie again for more adventurous palates. However, for a crowd-pleaser, I will stick with the Original Deep Dark Brownie. 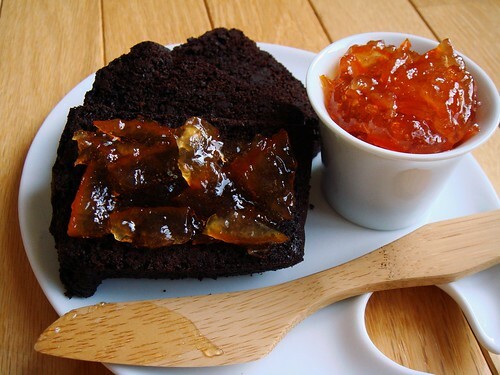 You can get the recipe from BAKED Sunday Mornings and check out the work of other members too! As for the leftover salted caramel? 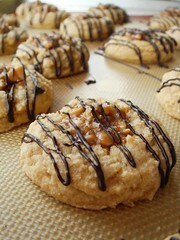 May I suggest making some Peanut Butter Cookies with Peanut Caramel? The proportions for the salted caramel between these two recipe is very similar. Just eyeball how much chopped peanuts to use to have right consistency for the filling. I was lucky that the leftover caramel from the brownies was the perfect amount to fill one batch of the cookies. However, if you happen to have more cookies than caramel filling, that bottle of Nutella from the last BAKED Sunday Mornings doesn't look too bad either. Life has come full circle.